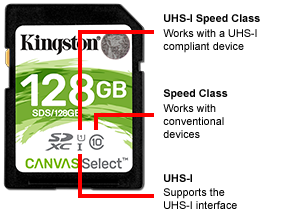 Kingston’s Canvas React™ SD card is designed to be as fast as you are, capturing 4K video or taking stunning brust-mode photos when the action doesn't stop . whether you're using the latest DSLR,mirrorless camera or flagship Android™* phone,you can be confident that that your memories will be safe. Ideal for shooting brust-mode photos and 4K video . Class 10 UHS-I U3 speed up to 100MB/s read , 80MB/s write . *** IEC/EN 60529 IPX7 certified for protection against continual water submersion for up to 30 min. and a depth up to 1m. Withstands temperature range from -25 °C to 85 °C. Based on MIL-STD-883H, METHOD 2002.5 military standard test method. Protected against X-ray exposure based on ISO7816-1 guidelines. **** Speed may vary due to host and device configuration.